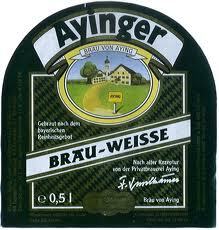 Cordial 60% barleymalt/ 40% wheat combination suits typically frothy golden-hazed Bavarian-styled beer. Fizzy carbonation explodes in mouth before concentrated grains settle beside yeast-sinewed banana-clove midst. At finish, nutmeg nestles banana nut bread insistence.